But psychopathy is heavily contested as a diagnostic category. And labelling a coworker a psychopath fails to account for how our workplaces can encourage bad behavior. 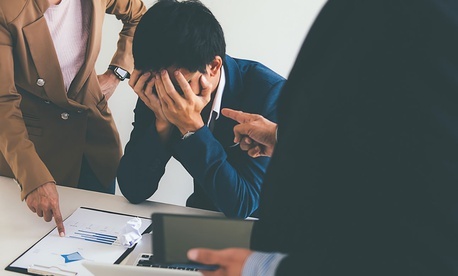 From an “ always on ” work culture to badly designed work practices, there are many reasons why a colleague could be behaving badly. This is partly why clinicians are prohibited from diagnosing someone from afar—there may be many other factors influencing the behavior. Of the 20 criteria used to assess criminal psychopathy, many do not translate to the workplace ( other measures have not been tested in work environments either). As we have seen in recent sexual harassment scandals in media and politics , when workplaces don’t punish employees for unacceptable or harmful behavior it gives tacit permission , in effect encouraging it to continue. Individuals behaving badly are often oblivious to the impact they are having, and so without proper sanctions and containment remain unaware of the need to self-correct. But there are also specific aspects of our workplaces that may contribute to such problematic behavior. People’s personalities aren’t fixed , which means that some human resources tools, such as testing for “ emotional intelligence ” (also known as EQ), may actually incentivize people to become more skillful at manipulating others’ emotions. As a result, coworkers’ coping strategies (including changing the way we think about a situation, using humor, or focusing on solving problems) become overwhelmed . This leaves them less able to attend to the day-to-day normal pressures of work, and to regulate their own social behaviors effectively. In other words, bad behavior in the workplace could be linked to fatigue, rather than to an aspect of a person’s character. Distress caused by difficult social contexts can also lead to “dissociation.” Dissociation is a self-protective mechanism that enables people to cut themselves off from their feelings of distress. But it can be experienced by others as coldness or a lack of empathy. Instead of miscategorizing these distressed people as psychopathic, we need to better understand and recognize early indicators of reactions that need care. To be accurately used in a workplace, the term “psychopathy” would require collecting data on thousands of cases of employees and examining variables that predict, for example, bullying, harassment, fraud, and other counterproductive work behaviors. This research does exist , but it is preliminary and needs replication with much larger samples. And finally, if you are really drawn to labelling a colleague a psychopath, you should perhaps also consider the question “is it me?” There is substantial psychological evidence that judgement about the actions of others are usually harsher than our judgement of our own actions—even when they are the same actions. Labelling someone a psychopath makes the issue about the individual, rather than focusing on what the organizational factors are that are contributing to the behavior. Previous Post | Should You Accept A Glass of Water at a Job Interview?